oel Harrison is one of the most adventurous artists in modern music. Guitarist, composer, arranger, vocalist, songwriter, bandleader – Harrison deftly juggles all of these roles while venturing across stylistic divides. Melding influences from jazz, classical, country, rock, and world music, his expansive sound fits equally well in jazz clubs and concert halls - and the occasional dive bar across town. For brevity’s sake it would be safest to call what Harrison does “jazz,” a descriptor that mutates to fit a staggering array of styles and approaches. He finds inspiration from music too often barred from admission into the jazz consciousness, taking his place in a tradition of exploration and interpretation that reaches through the open-eared reinventions of Miles Davis and Charles Ives to the American rhapsodies of Walt Whitman, Jack Kerouac, or Hank Williams. Simple to define, perhaps, but much harder to accomplish. Harrison’s success can be seen in the accolades he has received: he was named a Guggenheim Fellow in 2010, is a two-time winner of the Jazz Composer’s Alliance Composition Competition, has received four grants from Chamber Music America and other commissions and grants from Meet the Composer, the Flagler Cary Trust, NYSCA, and the Jerome Foundation. Harrison exists at a crossroads where seemingly disparate genres meet in surprising ways. His groundbreaking Free Country ensemble reimagines country and Appalachian folk music, while his Fojoto Trio with banjo player Tony Trischka and West African kora player Foday Musa Suso ties American roots music to traditional African songs. The new project Skin and Steel is a duo with the young Indian sarod master Anupam Shobhakar in which Harrison plays a National Steel guitar, not only a unique pairing but quite probably the first meeting of the two instruments. 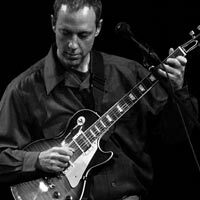 A gifted arranger, he has also delved into the work of other composers – Beatles guitarist George Harrison, for instance, on 2005’s Harrison on Harrison, or legendary drummer Paul Motian, whose repertoire Harrison arranges for string quartet and two guitars on his latest CD, String Choir. No matter the source material, it is filtered through Harrison’s individual perspective, more an act of recomposition than arrangement. Perhaps the most vivid examples of his own take on such experiments can be found on Range of Motion (1997) and The Wheel (2008), which bridge Harrison’s interests in classical and jazz. The former was written for an octet with woodwinds featuring Paul McCandless and bassoon player Paul Hanson; the latter also integrates the composer’s country and world music influences, replacing the winds with a string quartet that includes violinists Todd Reynolds and Christian Howes, violist Caleb Burhans, and cellist Wendy Sutter. The boundaries are further blurred in Harrison’s latest project, Singularity, which utilizes the techniques of contemporary classical composers like John Adams, Charles Ives, and Olivier Messiaen in compositions for a septet of modern jazz’s finest instrumentalists. The ensemble includes Christian Howes (violin), Donny McCaslin (saxophone), Dana Leong (cello), Gary Versace (piano), Stephan Crump (bass), and Clarence Penn (drums), taking their place alongside the likes of Nels and Alex Cline, David Binney, Norah Jones, Dave Liebman, Uri Caine, Jamey Haddad, and Dewey Redman on Harrison’s impressive list of collaborators. Life Force, a collection of duos for cello and violin performed by Wendy Sutter and Tim Fain, marked Harrison’s first album consisting entirely of non-improvised music, released on Philip Glass’ Orange Mountain Music label. He has also written extensively for percussion, a 2007 solo for marimba winning first prize in the Percussive Arts Society’s worldwide competition. Harrison's "Search" Reviewed in DownBeat! Joel Harrison 7's "Search" was reviewed in the June 2012 issue of DownBeat. 4 Stars! Very nice review of Joel Harrison\'s \"Infinite Possibility\" in DownBeat.